We go through our day lifting all different types of objects and specific to our profession, lifting people as well. We have this obligation to keep our patients safe during all transfers, whether it’s a supervision transfer or a Maximal Assistance transfer. Sometimes we can be so focused on our patient’s safety (which is also very important), that we forget about our own safety. If we injure ourselves during a transfer, not only are our patient’s also in danger, but how are we going to perform our jobs? 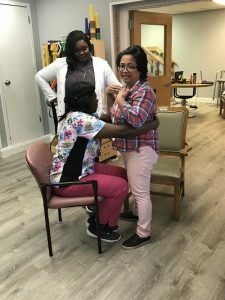 This is why the rehab department at Gates Manor felt it was important to in-service all facility staff members on proper body mechanics during all daily tasks, from on the job and dressing a patient at bedside to off the clock and taking boxes down from the attic. Recently, our rehabilitation department held an in-service for all facility staff at 2:30 in the afternoon. Let’s be honest, everyone has been working all day and most are ready to go home, so an afternoon in-service is the perfect place to “take a nap.” Knowing this, the presenters didn’t’ want to just stand up in front of the group and rattle off a bunch of facts that will go in one ear and out the other. Instead they created a fun and interactive learning environment that actively engaged all attendees. Load- always test the load before lifting. Lever- Keep the load close to your body. Lumbar- Keep your back straight. Legs- Use your legs- do not twist your back. To conclude, we discussed energy conservation tips to promote the most safe and effective work environment. The presenters created a fun and interactive way of learning in which attendees were actively engaged and participating. Attendees reported “retaining more of the information and a better understanding of how to implement the information,” through the use of demonstration and participation. The in-service was an effective way to re-educate staff on proper body mechanics and transfer techniques and how to implement them into their daily tasks. Therapists were very pleased with attendee’s feedback on the presentation and their willingness to participate. Attendees were very appreciative of the therapists taking time out of their day re-educate them on this important topic. It was a great day! Our body is a very important piece of equipment. With proper body mechanics you are of good service to your job, other people, yourself and etc. Education has always been the way of prevention.